This year, try something a little different! In California, we are lucky enough to enjoy BBQ season year 'round. This November, put your sweater on and grill your Thanksgiving turkey to perfection. 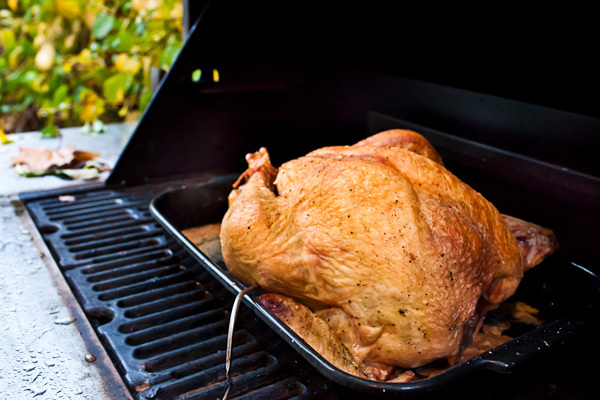 Here are some tips that we have found to be a must to develop that same juicy, tender, flavorful meat when barbecuing a turkey. Turkeys are terrific when barbecued! *Quick reminder: do not stuff a turkey you plan on grilling! Prepare charcoal-covered grill by removing cooking grate and opening all vents. Position drip pan in center of charcoal grate and place 25 to 30 briquettes along each side (lengthwise) of drip pan. Burn briquettes until covered with gray ash, about 30 minutes. Place cooking grate in grill over coals. 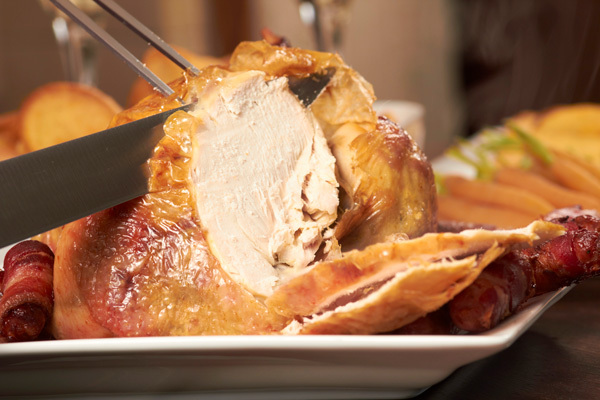 Prepare fresh or thawed turkey by removing giblets and neck, draining juices and patting dry with clean paper towels. Turn wings back to hold neck skin in place and tuck legs. Brush or spray entire turkey with cooking or vegetable oil. Place turkey, breast up, on cooking grate over drip pan. Cover grill, leaving vents open. Add 6 to 8 briquettes to each side every 45 to 60 minutes. Using a meat thermometer, cook turkey to internal temperature of 180°F in thigh and 165°F in breast. A 10 to 16 lb. turkey will take 2 to 3 hours to grill. When done, remove and let stand for 15 minutes before carving. Remove stuffing. Let the bird rest or 20 minutes, and use a sharp knife. Remove the legs and wings by slicing down into the crevice between the main body and the leg or wing. Grasp the leg or wing firmly and twist and pull while sliding the blade of the knife between the exposed joints to separate. Cut thin slices from the thighs and the legs to serve. The wings can be separated into two parts and served as is. With the bird breast side up on the cutting board slice downward from the breastbone. Beginning with the rounds part of the breast and working your way inward toward the bone. Make sure you use your meat thermometer. After the turkey rests, the breast should register 170°F, and the thigh, 180° F.
If you are cooking a stuffed bird, make sure the temperature of the stuffing registers at least 160 degrees F.